The main principles in acetabular reconstruction are restoring the centre of rotation, acetabular continuity and integrity, and replacing the subchondral bone layer with a metal mesh. From a biomechanical point of view it is very important that a stress pattern in the acetabular region is created comparable to the normal situation (Crowninshield et al. 1983). 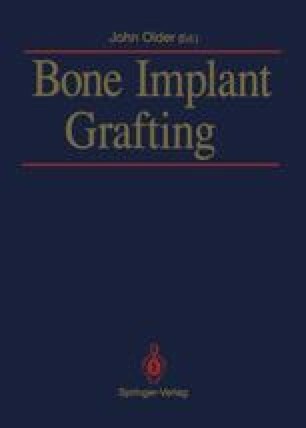 A trend towards a more biological reconstruction with bone grafts has therefore taken place, instead of reinforcing the acetabulum with massive amounts of non-viable materials. We strongly support this biological view, and use an acetabular bone grafting technique developed by Slooff (Slooff et al. 1984) in which we use morsellised bone as much as possible instead of solid blocks.